A Cain and Abel novel of race, jazz, obsession, and revenge…. 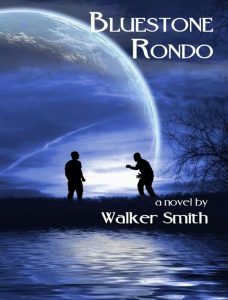 Bluestone Rondo is a racial Cain and Abel story set to a score of jazz, obsession, and revenge. In 1927, a black tenant farmer’s wife gives birth to unusual twins—one is dark and one is light enough to pass for white. Growing up to learn that color is worth more than brotherhood in the Jim Crow South, they fall into a trap that was set for them by generations of racial discord. After a violent fight, Joe disappears and Calvin is convicted for his murder. As Calvin’s life takes a downward turn, Joe basks in the bright lights of New York as a successful white Jazz singer on 52nd Street. After marrying Magda, the blue-eyed girl of his dreams, his fear of exposure takes a turn for the irrational. The entertainment industry is in a cold-sweat panic over Joseph McCarthy’s Blacklist, and Joe feels threatened by the non-stop radio reports of blacklisted witnesses “naming names.” He is unable to break the moth-and-flame hold of black trumpet player Doc Calhoun and his unforgettable wife Pearl, a paradox of wisdom and heroin addiction. And Joe begins to see his brother in the shadows. Bluestone Rondo is a story of life-and-death choices—a Jazz masterpiece of love and hate that leads to two volatile plot twists and one fatal showdown. “I loved the story of twin brothers as different as night and day. The story took place in the south at time when it was so hard for black families the make ends meet. Joe and his brother could not get along at all. They were on two different paths. Joe passing for white in the end was his down fall. I love the way author tells the story of two boys from childhood to men and all the different turns in their lives. I really enjoyed this book and will recommend it to my friends.” – Marjorie T.